It was raining again today and we couldn't go outside to look at bugs (my son's newest obsession), so I told him that we could look for bugs IN the house. I didn't want to actually find real bugs, so we checked out my collection of bug books. 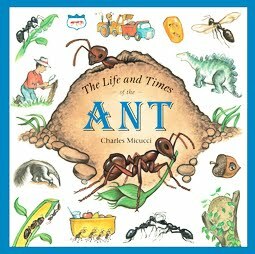 The Life and Times of the Ant by Charles Micucci was his favorite. It has great pictures and diagrams. We didn't read much of the book because it is way too hard for a toddler to understand... but we did talk about the different jobs the ants have and what they eat and do while we looked at all the pictures. After we were done reading, we decided to make our own ant. We found a great ant project here and tweaked it a bit. Materials Needed: Egg carton (3 pieces), black pipe cleaners (enough for antennae and 6 legs), black paint, paint brush, tape, googly eyes, and scissors. 1. Cut the egg carton so that you have three pieces (head, thorax, abdomen). We sang my ant version of "Head Shoulders Knees and Toes" while we cut and started to paint. We also pointed to the body parts on this page in the book. 2. Next we got out our black paint and started painting the egg carton pieces. 3. While my son painted, I stuck black pipe cleaner through the head to make some antennae. 5. Use tape or glue and add the googly eyes to the head. 6. Tape the body parts together so that they are sturdy. 7. Stick three pieces of black pipe cleaners through the thorax to make six ant legs. My son loved making his ant crawl all around the house with him once we were done. We also found a cozy place for the ant to sleep since my little guy wanted the ant to sleep in his room with him. After we painted our ant and were waiting for it to dry, we did a tasty hunting activity. We looked for the "ants" (chocolate chips) that were hiding in the "dirt" (crushed oreos). If you are healthier person, I'm sure you could find something better to substitute, but we had a blast with this activity. Be warned though, it makes a HUGE mess! We buried the chocolate chips in the dirt and then I gave my son a bowl to put the "ants" in... when he found them. Then I made a little ant hunt worksheet. I'm sure there are better ways that I could've done this, but it worked fine. When we found the ants, we put them on the circles and built bigger ants. Then we counted our big ants. We ended this activity with a bath and some sweeping! I have a feeling we'll be doing more bug projects in the next few weeks. This looks like so much fun! I especially love the ant hunt where you get to eat the dirt! Such a clever idea. What a fun way to "look" for bugs inside! My son is currently on a bug kick too! This is the cutest idea I have ever seen. Thanks for the fun project. My daughters gonna love this!